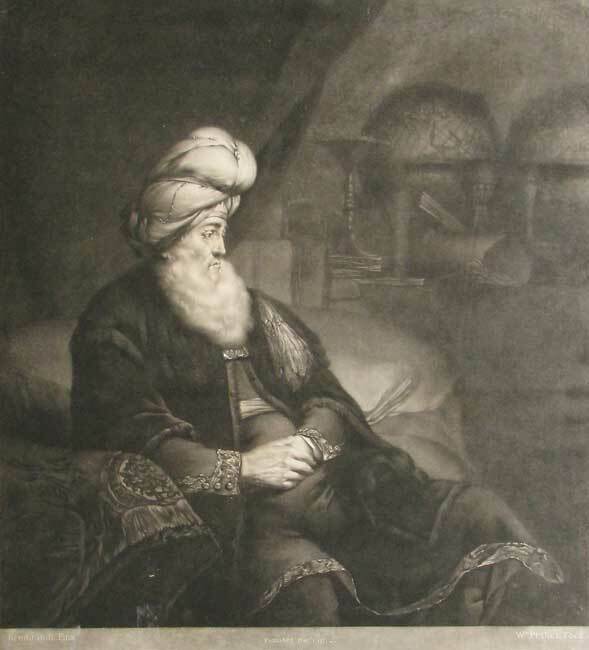 The Rabbi is pictured on a cushioned seat wearing a high turban. He has a long white beard and has his hands clasped across his lap. In the background there are scrolls, globes and books; a curtain hangs to the right behind. William Pether was born in Carlisle in 1731. In 1756 he received a premium from the Society of Arts and in 1763 he became a member of the Free Society of Artists. He was admitted to the Royal Academy in 1778. He painted portraits in both oil and miniature and also studied the art of mezzotint engraving. It was through the latter that he became a pupil, and then partner, of Thomas Frye with whom he gained great excellence, particularly with his pieces after Rembrandt and Wright. He is thought to have died in 1795.